The Swedish tattoo artist Niki Norberg is definitely no rookie in the industry, and have been tattooing since 2001. He has previously worked in the well reputed Heidi Hay Studio, and have in 2012 started to work in another very well reputed studio, Wicked Tattoo along with another incredible tattoo artist and studio owner Carl Löfqvist. 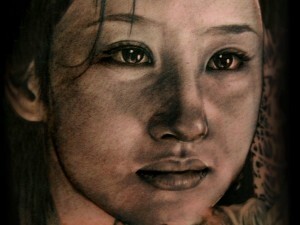 Niki’s specialty is realism, and there is no doubt that he mastered the genre extremely well. Perhaps his favorite to do black and gray, and when I look at his various creations I am simply astounded by the detail and incredible softness as he composes together. Niki Norberg is undoubtedly one of Sweden’s foremost realistic tattoo artist and he can easily be compared ot the rest of the world’s top tattoo artists. For me there is no doubt that Niki is an obvious choice for Tattoo Art Project, so I welcome him warmly and look forward to a lot more of his incredible work! Previous Alex De Pase, a favorite!